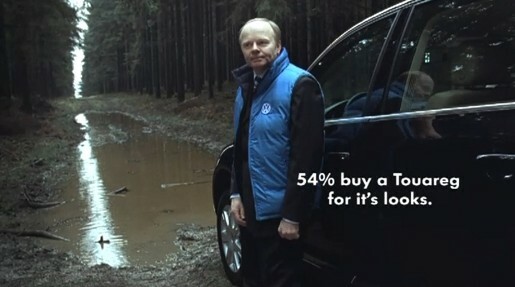 Volkswagen presents the sports utility vehicle Touareg in a humorous television commercial fronted by a presenter who will do anything to avoid his vehicle getting dirty. The ‘Keep It Clean’ advertisement, released in the Netherlands in 2007, has just won a gold award at the 2008 Clio Awards. The Volkswagen Touareg has a 28 degree approach angle so it has no problem at all handling rough terrain. That’s the theory according to this clean-loving commentator. The Touareg Keep It Clean ad was developed at DDB Amsterdam, Amstelveen, by art director Joris Kuijpers, copywriter Dylan de Backer, Account Executive Jules Hooijer, and agency producer Yuka Kambayashi. Filming was shot by director Bart Timmer via Czar with director of photography Lex Brand, with producers Sytske Rijkens and Robert Nan. Editor was Marc Bechtold. Post production was done at AVP Amsterdam. Sound was designed at FC Walvisch, Amsterdam.